Ah yes, Aeria Games, the company that seems to be consistently cashing out on a lot of MMORPGs right now. With the mobile platform as its newest source of revenue, we have another title out from the game publisher of the eCCG variety. So the company has now used the Dragon theme as its new setup for its latest mobile eCCG titled, Dragon Legion, moving on from their racy pirate title (Pirate Maidens, my review located here). Dragon Legion uses the eCCG mechanic as its main gameplay element. With the emphasis on a “squad” like team setup which has been part of the usual eCCG gameplay setup. You control units/cards that have elemental affinities which you can level-up and evolve. 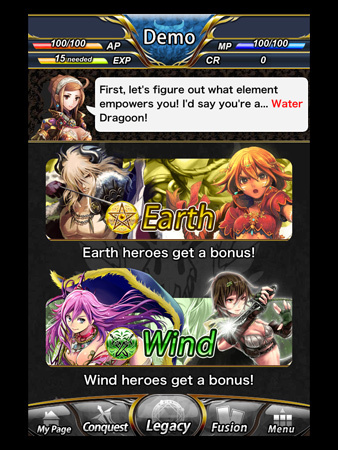 The game has a mission/quest type system in place that is called conquest; this serves as a reprieve from the Dragon Battles, the game’s main PvP/battle mechanic and would serve as another means for you to get more cards/units for your team. So moving on to the game’s card system. Dragon Legion uses the four-element affinity system to classify the monster units you’d be getting. The elements are the expected Fire, Wind, Earth, and Water. Each element has its own strengths and weakness against other elements. Cards are further classified by rarity ranking from Normal, to Normal+, to Rare, to Rare+ to Super Rare+ and so on and so forth. 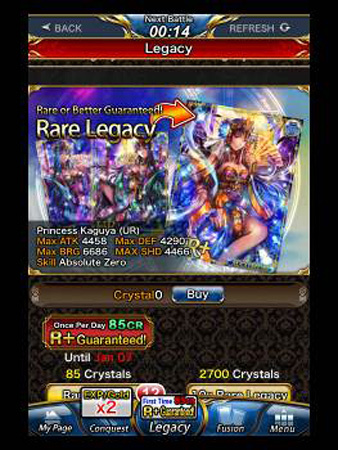 Card packs are then acquired through the in-game store using legacy points and of course the in-game premium currency. Similar to booster packs of actual CCG/TCG games, the cards you get have a random quality of rarity, with the more expensive “packs” providing you with higher rarity, and in essence, stronger cards than the cheaper variants. Aside from the rarities, the game also has an album system in place which pretty much covers the collecting part of the game. You can also level up your cards in which does more than just increase their base stats, but also can unlock skills that you can then equip in your squad page. 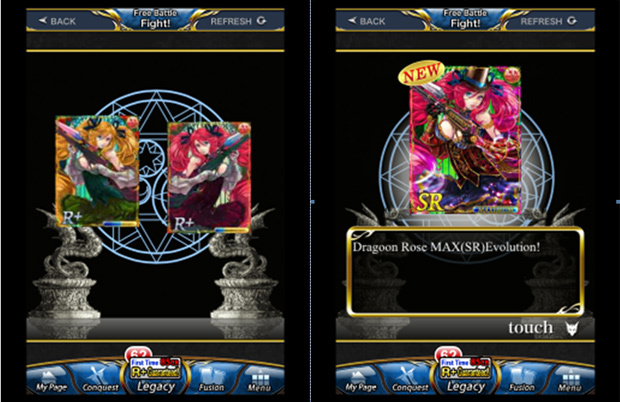 Leveling up your cards requires you to expend other units and the game also has a currency cost as you do it. The alternative of leveling on the other hand is “evolving” your cards to create a stronger (and higher rarity) version of the card. The card also gets an alternate art and will receive 5% of the stats of the card it was merged with, further increasing the possibility of having the same card types but having different stats in-game. 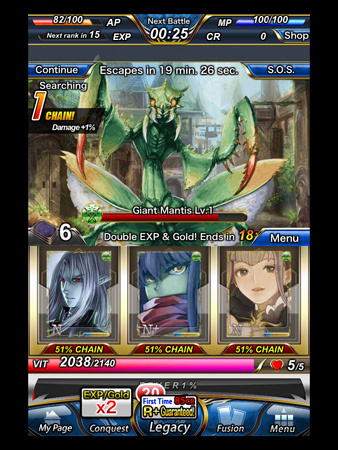 Dragon Legion’s battle system, tagged as Dragon Battles, are the game’s main gameplay mechanic. It has two versions which are namely the Free Battles and the Legion Battles. While the game has two types of battle systems in place, the process where they would happen are the same on both types. The only difference between these two are the people you battle with. As the name implies, Free Battles are PvPs that are composed of random people getting together and fighting one another. On the other hand the Legion Battles are battles where you fight against opposing legions for the honor of your legion. 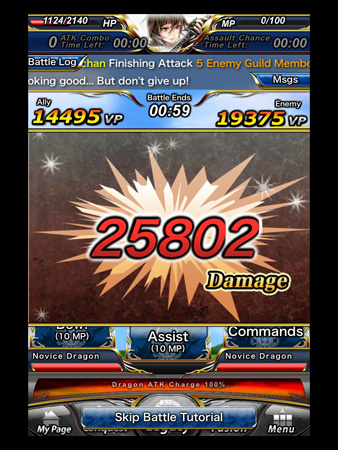 Battles in Dragon Legion are basically a real-time exchange between a set of players in an arena. 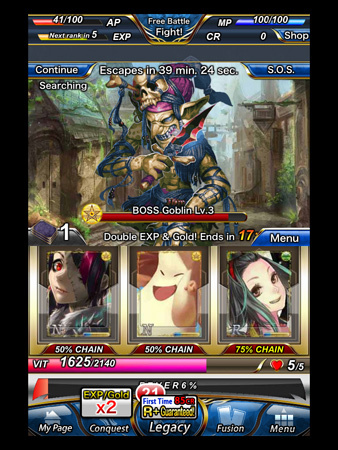 The game automatically puts you into three roles depending on your squads total damage output. The heavy hitters are put into the front lines as the Warriors. The remaining roles are archer and tamer classes, which typically have lower attack strength. Each team is represented with its own dragon, and each player has their own set of role-dependent moves that you can use. Each move (composed of three types) expends your MP which you would need to recover via the use of in-game items or waiting it out. You can in fact jump in or out of battles as you please, but you can’t join new battles till the one you are in is done. 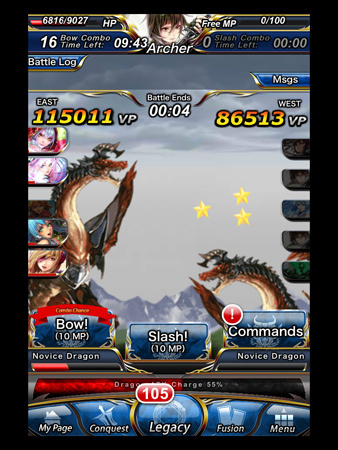 These battles’ win condition is based on the amount of Victory Points each team has at the end of the duration. The team with the highest VP at the end of the duration wins. All in all, I can say that Dragon Legion is a good time-sink for anyone looking for a mobile CCG to sink their teeth into. However, the basis of me saying that is relying heavily on the game’s battle system. Take it away and the game is pretty much a generic CCG game with a consistent battle system in place. The quest system is a joke and is an obvious ploy for players to spend time on the game if they get bored PvPing. The game’s appeal banks heavily on its battle system which seems to be getting a lot of action regardless of the time you come in. Having lots of players battle at almost 24/7 is a good indication that the chances of you facing teams that are practically dead are less than likely. Aeria Games obviously knows Dragon Legion’s strength. I can say that if you’re looking for a CCG game that can make you keep on coming back then this one’s a good one. However, if you’re looking for something different, or at least a CCG that has a little more substance, stay away from Dragon Legion. ARGO Online began its new open beta test on April 29 with UserGames.com.